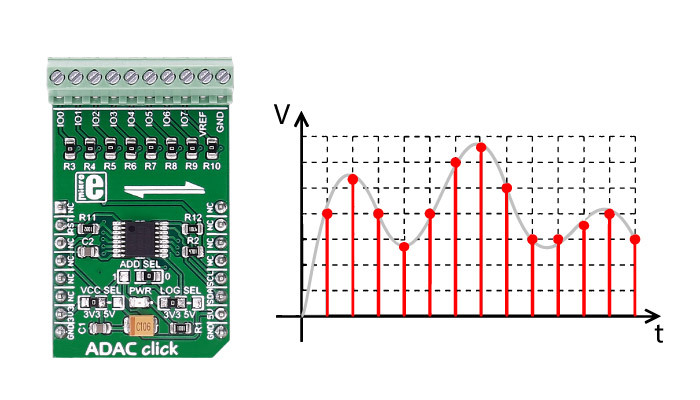 ADAC click is an 8-channel 12-bit ADC, DAC and GPIO. It carries the AD5593R configurable ADC/DAC. The click is designed to run on either 3.3V or 5V power supply. ADAC click communicates with the target microcontroller over I2C interface, with additional functionality provided by the RST pin on the mikroBUS™ line. Every channel can be set individually as ADC, DAC, or GPIO. The 12-bit conversion values are readable through I2C. For resetting the IC, use the Reset pin (RST). The AD5593R has eight input/output (I/O) pins, which can be independently configured as digital-to-analog converter (DAC) outputs, analog-to-digital converter (ADC) inputs, digital outputs, or digital inputs. When an I/O pin is configured as an analog output, it is driven by a 12-bit DAC. The output range of the DAC is 0 V to VREF or 0 V to 2×V REF. When an I/O pin is configured as an analog input, it is connected to a 12-bit ADC via an analog multiplexer. The input range of the ADC is 0 V to VREF or 0 V to 2 × VREF. The I/O pins can also be configured to be general-purpose, digital input or output (GPIO) pins. Applications control and monitoring, measurement, etc.